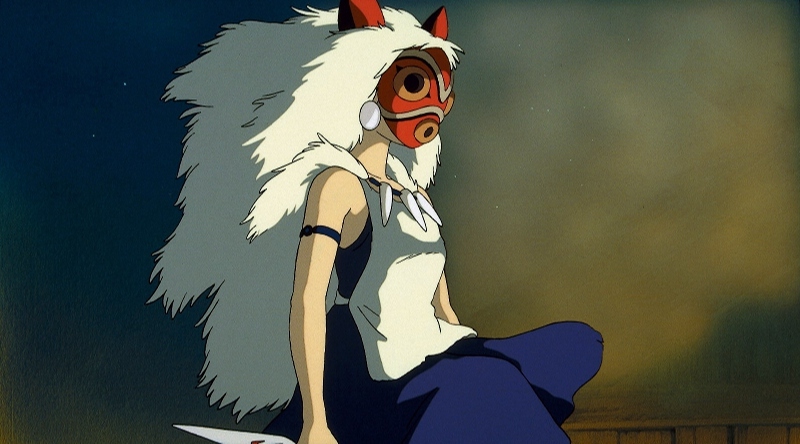 Hayao Miyazaki's Princess Mononoke (1997) was the first of several Japanese animated feature-length films to make a real impact Stateside, alongside now-famous genre classics as Akira and Ghost in the Shell. I was lucky enough to catch Mononoke theatrically during its very limited 1999 domestic run...not because I was particularly invested in the director's work (yet), but simply because movie theaters in the area rarely showed anime. 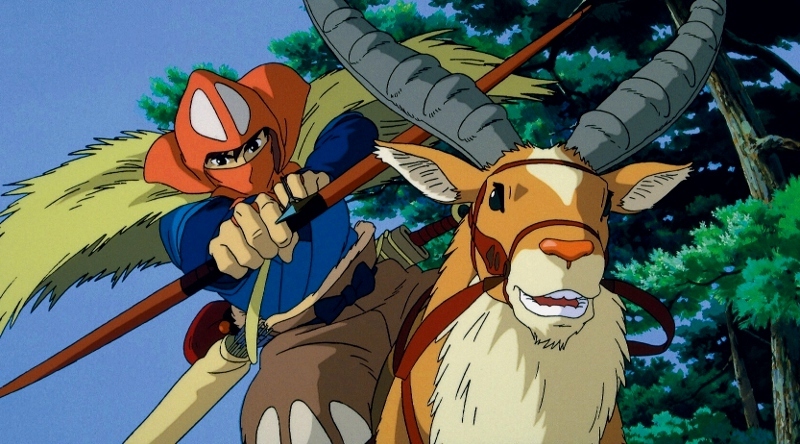 Not surprisingly, the film's epic scope, fantastic visuals, and colorful characters quickly captured my attention...and unlike the majority of anime I've seen before or since Mononoke, this movie still holds up extremely well. Simply put, the film's accessible but ambitious approach to storytelling and visual design are still extremely impressive almost 20 years later. Our title character isn't the focal point of Mononoke, at least not initially. The bulk of our journey follows Ashitaka, a skilled archer and Emishi prince who departs from his village after killing a demon who wounds him during their battle. The injury gives Ashitaka supernatural fighting abilities with a death sentence, as the accursed wound will soon infect his entire body. During Ashitaka's search for a cure, he meets a number of questionable characters: first is Jiko-bo, a seemingly helpful travelling monk who points Ashitaka towards a forest spirit. Lady Eboshi, the ruler of Irontown and a skilled weapons manufacturer, meets Ashitaka after he rescues some of her men. Most importantly, he meets the elusive San, a young girl who travels with a clan of wolves in the massive forest surrounding Irontown. Lady Eboshi, who threatens the forest and surrounding environment with her iron manufacturing, refers to San as "Princess Mononoke" (very loosely interpreted as "spirit and monster"), but Ashitaka knows immediately whose side he belongs on. The film's environmental message is heavy but not overbearing, leaning towards cynicism by insisting that the human race may never live at peace with nature. 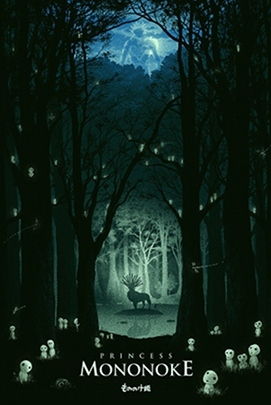 Yet Princess Mononoke can be taken at face value and still enjoyed as a highly original and visually ambitious production. 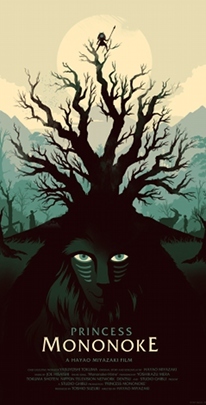 Featuring limited CGI to enhance the film's beautiful hand-drawn animation and striking backgrounds---as well as a terrific score by frequent Miyazaki collaborator Joe Hisaishi----it's as beautiful to listen to as it is to watch, and your choice of how to interpret it just makes Mononoke more timelessly relevant. If you've only limited yourself to a handful of Japanese animated films, this should be one of them. 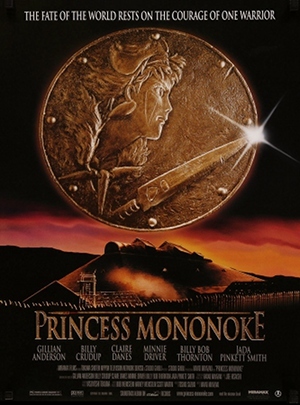 Originally released on Region 1 DVD in 2000 by Miramax, Princess Mononoke received a Blu-ray upgrade from Disney in 2014...but it wasn't an entirely satisfying package, as the only subtitle option followed the English dub instead of a proper translation. That problem has been solved (as well as a few smaller ones) with GKIDS' brand new Blu-ray, which arrives as part of a Ghibli re-release wave after acquiring the rights from Disney earlier this year. We'll have more reviews up soon including Kiki's Delivery Service, Spirited Away, My Neighbor Totoro, Howl's Moving Castle, and Ponyo. Disney's 2014 Blu-ray featured a suitably stunning and stable 1080p presentation sourced from a recent master, and unsurprisingly GKIDS' new Blu-ray looks more or less identical to my eyes. Though I don't have the tools to to a side-by-side comparison (either on-screen or via captures), I spot checked a handful of scenes from both discs and found no major variances in detail, texture, black levels, compression, bit rate, and color balance. Quite simply, both looked fantastic and virtually flawless, aside from trace amounts of banding during a handful of tricky gradient scenes. Overall, this seems to be a clear case of "if it ain't broke, don't fix it", so fans will have no reason to be disappointed here. Also like the Disney disc, viewers can still choose between the original Japanese 5.1 track or a fairly good English 5.1 dub (featuring the likes of Gillian Anderson, Claire Danes, Billy Crudup, William Robert Thornton, and more)...but I've always been partial to the original Japanese, so that's what I mainly focused on. Oddly enough, this new Blu-ray sounds a bit different than Disney's: some of the louder sound effects (especially during action sequences) are dialed down a few notches and thus balanced more evenly with Joe Hisaishi's original score, which gives certain parts a slightly less "overcooked" atmosphere that's perhaps easier on the ears. But this isn't a night-and-day difference, as it's a fantastic mix no matter which disc you're spinning: featuring a solid amount of LFE, great use of the surround channels, crisp dialogue, and excellent separation, Mononoke is one of the best-sounding films in Ghibli's back catalog. What's more is that optional English subtitles are, for the first time since Miramax's 2000 DVD, available in both dubtitles (for the English track, naturally) and a literal English translation of the Japanese track, which has been provided by Studio Ghibli according to the packaging. This is a major plus in my book; perhaps not worth a double-dip, depending on your audio preferences, but definitely worth noting as it was my only major gripe with the previous Blu-ray. Speaking of the Disney disc, your chosen audio setting also changes on-screen text to match, either by eliminating the Japanese kanji entirely (during the introduction, which is narrated by Keith David on the English dub) or translating them completely (during the closing credits). An optional French dub with matching subtitles is also included. GKIDS' static, silent menu interface is smooth and simple to navigate, offering separate options for audio/subtitle setup, chapter selection, and bonus features, with no annoying trailers beforehand and a handy "Resume" function. This two-disc release arrives in a dual-hubbed keepcase with attractive two-sided artwork and a matching slipcover; a nice Booklet is also tucked inside, featuring short reprinted essays by producer Toshio Suzuki and director Hayao Miyazaki. Everything from Disney's 2014 Blu-ray, basically. These recycled extras lead off with "Princess Mononoke in the USA" (19:54), a 1999 document of Hayao Miyazaki's Stateside tour promoting the film. Footage from a few premieres is shown throughout the US and Canada, as well as a trip to Disney headquarters. A handful of original and alternate Trailers is also included in English and Japanese, although one of them is nearly five minutes and contains plenty of spoilers. We also get a Storyboard Reel that plays during the film and includes lots of Miyazaki's original drawings, as well as a "Behind the Microphone" featurette with members of the English dub cast and another Trailer in English. All the bonus features are presented in English, Japanese, or both, and include forced subtitles for translation purposes only. 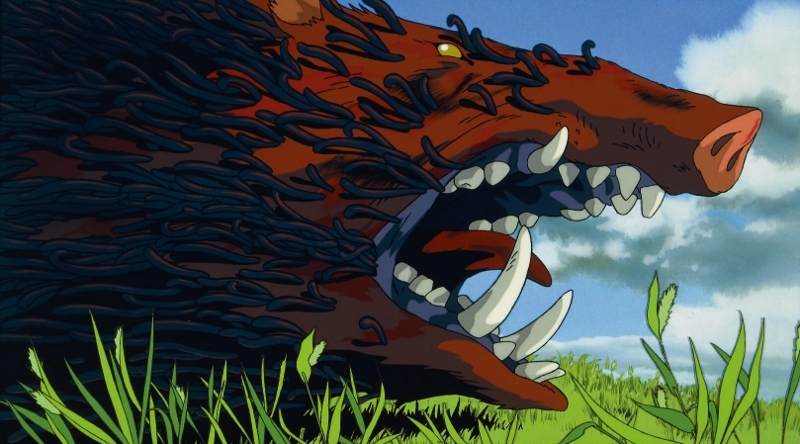 Princess Mononoke is a visually stunning, accessible, and thought-provoking slice of Japanese animation that remains in the genre's top tier more than two decades after its original release. It's a sprawling and epic adventure loaded with intrigue, mysticism, and bursts of grisly action, all framed by some of the finest hand-drawn animation in recent memory. The film has gotten a lot of exposure on Blu-ray in recent years: Disney's 2014 disc was a fairly solid effort, but this new Collector's Edition from GKIDS offer a slight improvement in several categories (slightly better audio, properly translated subtitles, and nicer packaging), which may or may not be worth an immediate double-dip if you already own the Disney disc. If you don't, this is obviously the version to get and comes Highly Recommended.